Buss Fuses were used on many if not most automobiles for decades. They can be found on the 1925 Steam Vehicle Corporation cars as well. 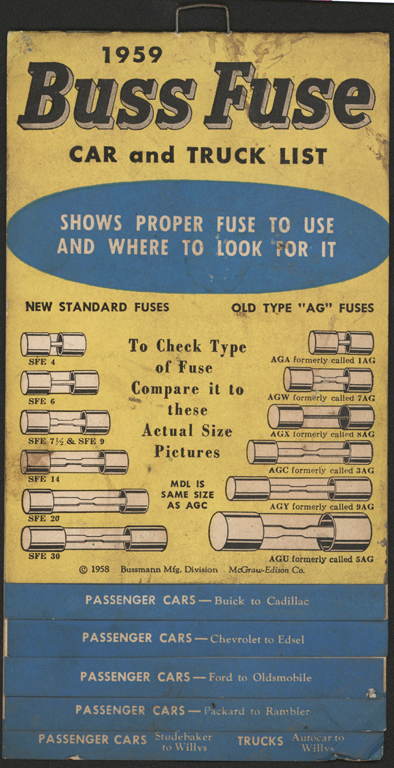 This Buss Fuse chart hung in gasoline service stations in the late 1950s and 1960s so that mechanics could use the correct fuse in servicing cars. Click on the chart image to find your car! Contact us if you have additional information about the Bussman Manugacturing Division of McGraw-Edison Company, Buss Fuses, or if you have questions.